One Loaf of Vegan Oatmeal Bread! 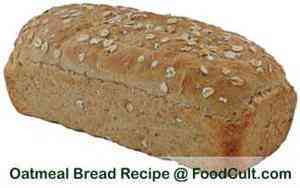 Now let's go make a loaf of this delightful, vegetarian oatmeal bread! Add salt, molasses and oil and mix vigorously. Add 1 1/2 Cup rolled (or instant) oats and mix well. Add 3/4 Cup Whole Wheat flour and beat 100 strong strokes with a wooden spoon. Add 1/2 cup of white flour and work it in well. Add the balance of the white flour 1/4 cup at a time working it by hand as the dough becomes too stiff to work with your spoon - adding flour only until the stickiness is gone from the dough. (After first rising) Turn dough out onto your (lightly floured) work surface. Press the bubbles out of the dough - flattening it into an oval shape. Cover it with a dish towel and let it rest for about 5 minutes. knead and shape the dough for the pan. spread a little oatmeal on your work surface and roll the top of the dough (the length opposite to the seam in the oatmeal. Slightly dampen the fingers of one hand and rub the top of the loaf (the side with the oatmeal to dampen very slightly) then roll the top on what ever may be left of the oatmeal flakes. This dampening of the top and oatmeal flakes helps the flakes stick to the dough. Place the dough in the pan seam side down (oatmeal flakes up) in the loaf pan. return the loaf to the oven for about 2 minutes - WITHOUT the loaf pan but - with the top still covered with foil. This is just a beautiful, vegan, oatmeal bread - rich in warm flavours contributed by a simple though delightful selection of ingredients. We prefer baking with whole, rolled oats rather than the quick oats ... and we use these rolled oats in this recipe as well. While essentially the same as quick oats, we prefer the firmer texture of the whole, flaked, rolled oat and the fact that it has been less processed/handled prior to our use. Besides, these large flakes of oats certainly look nicer than a few small crumbs of oat pieces. Unlike most of our other loaves, we use molasses to sweeten this loaf. We like the warm flavours of the rolled oats and a bit of whole wheat flour. The beautiful, warm sweetness of the molasses, added very modestly, plays nicely with these other ingredients. Still, this is the easiest oatmeal loaf to make and should be included in any home baker's repertoire of breads. It could end up being a favourite - even with those who aren't oatmeal lovers. This recipe yields one full-sized loaf of about 1 1/2 Lbs (about 600 g). Please note: This recipe has not been tested with steel cut oats. Using steel cut oats may cause need to adjust the volume of oats and/or other ingredients.